Last edited by ResumeSpeed; 07-03-2018 at 03:29 PM. I wonder what Triple Nickle looks like? Might just be Billet Silver, need the paint codes. 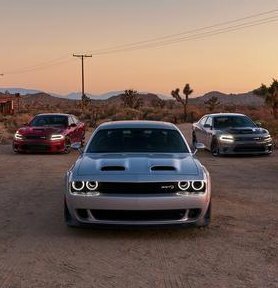 Some good info here- R/T gets the old Hellcat hood and standard STP. Sweet. So, I think I will stop looking at the 18's and get a 19. Last edited by ResumeSpeed; 06-29-2018 at 10:59 PM. Because they love torturing us, LOL, my beloved Billet Silver is now also gone. They actually deleted Redline Red early in 2018 so not many built in that color last year. What is a GT RWD? Isn't that just an SXT Plus?? Believe it is an SXT with GT badging, 20-inch Granite Crystal wheels, Super Track Pack and the Alcantara ventilated seats standard. The Triple Nickle might look classy. I would not have minded Titanium back or the bright silver either. But B5 and Hemi Orange are still my favorites. I noticed the GT AWD has STP. For someone who has a GT now, does that mean the suspension is the lowered STP that comes with other trims?